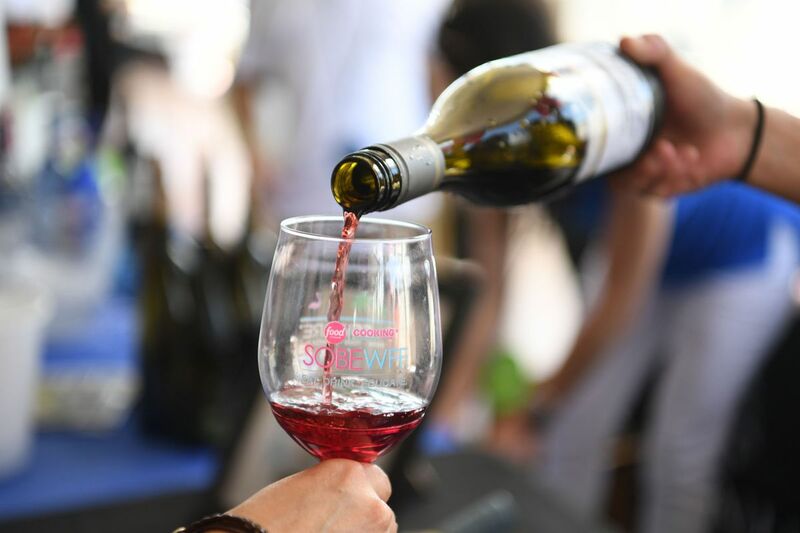 Bust out those stretchy pants and make sure to bring an appetite because the 18th annual Food Network & Cooking Channel South Beach Wine & Food Festival (SOBEWFF) hits Miami February 21-24. The massive event sprawls two counties and has inspired a New York City offshoot. Over the the past 17 years it has raised more than $28 million for the Chaplin School of Hospitality & Tourism Management at Florida International University and gives its students real-life culinary and event experience throughout the weekend. Here below is everything guests need to know about what to bring, what to wear, and what events are available for every appetite and budget. Once upon a time, the festival was basically limited to the sands of South Beach but not anymore. With the more than 100 events happening, the festival has expanded throughout South Florida from Coral Gables all the way up to Fort Lauderdale. But, staying true to the name, many of the big events still happen on South Beach and its general vicinity. While being on time is something most people have never heard of in South Florida, note that these events begin and end precisely when they say they will. If an event is over at 10 p.m., don't think that at 10:01 p.m. it'll be possible to grab that one last drink. Oh, and speaking of drinks, taking them out the door after an event is severely frowned upon and could even get someone in trouble. Since there will be copious amounts of booze at just every event, the best bet it to either find a designated driver or use a rideshare app like Lyft or Uber. Available parking at events is limited at best, as as Lyft is the official partner of the festival this year it is offering 50 percent off two rides (up to $5 per ride) between the February 18-25 with the code SOBEWFF2019. This year the festival has added a strict bag policy to its mix. 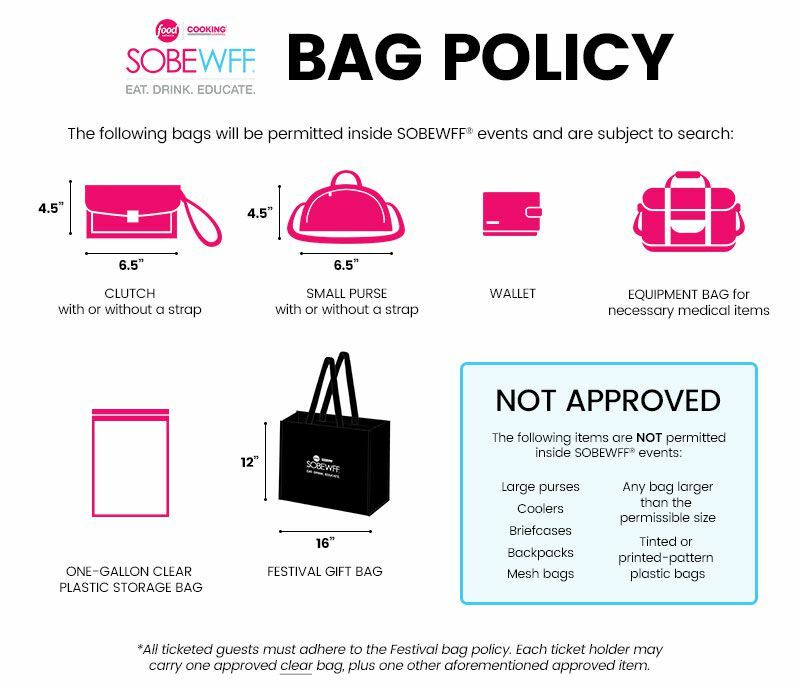 No large bags will be permitted this year — only small clutches, wallets, handbags, or the festival provided bags. So leave the backpack at home or you won’t make it through the door. Ladies, do everyone a favor and leave the high heels at home for any event on the beach (and most marquee events are located there). Inevitably, the shoes will be ruined because you'll spend the whole night sinking into the sand – not a good look. Sandals are the best option (or boots if the temperature drops). Now this is important: do NOT leave home without an ID to show you are of age, because someone will ask you for it at some point in time. And don’t forget to bring your ticket! No ticket, no entry. Period. And lastly — and maybe most importantly — bring a stockpile of wet wipes and antacids to the event because you will be eating a lot. Thank us later. And while South Florida is usually bright and sunny this time of year, the events are rain or shine. Meaning no event will be cancelled due to weather, and no refunds will be given. The event that started it all. The two-day, wine-filled Grand Tasting Village runs February 23-24. Each day it features more than 50 restaurants handing out food, while 100 different wine and spirits suppliers pour unlimited samplings. 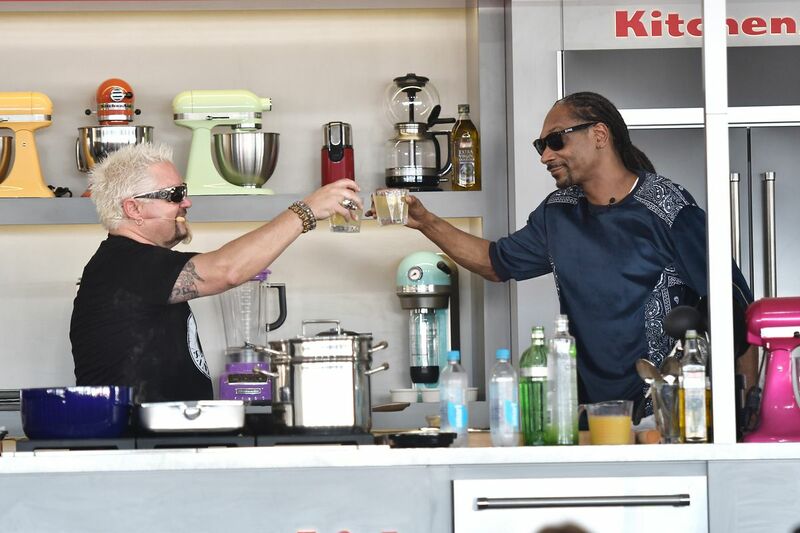 If that isn’t enough to make someone’s head spin, there are also an array of culinary demos featuring everyone from Guy Fieri to Trisha Yearwood along with plenty of interactive activities. There will be crowds, so be prepared to wait in some lines, but they move quickly and there is more than enough food and drink to go around. And it wouldn’t be Miami without a party, so the festival is bringing back David Grutman to take over the Village’s courtyard for his “David Grutman Experience" on Sunday, February 24 hosted by none other than Ludacris. And for those who don’t want to drop the $225+ for tickets, on that Sunday guests can purchase a late afternoon ticket that offers access from 3 to 5 p.m. for $100. The festival adds some new blood into the rotation each year. Highlights include the cocktail focused Mixing It Up on the River by the DRINK Miami team, Taste of Jamaica hosted by Cindy Hutson and Delius Shirley, the Rose Pool Party by dapper chef Geoffrey Zakarian and Chateau D’Esclans, and even a Drag Brunch hosted by radio personality Elvis Duran. Each evening (beginning Thursday, Feb. 21), showcases at least one large-scale tasting event per evening. Kicking off the weekend is the Barilla's Italian Bites on Thursday, February 21, followed by the Heineken Light Burger Bash now hosted by David Burtka and Neil Patrick Harris, on February 22, which runs at the same time as the swanky Wine Spectator's Best of the Best. Saturday, February 23, Coca Cola takes over the beach with its Beachside BBQ with the king of flavor town, Guy Fieri. Rounding out the weekend is a Trisha Yearwood Southern brunch and Bacardi’s Beach Carnival. You don’t have to break the bank in order to enjoy the festivities. Plenty of booze-centric events have tickets for under $100 including the craft cocktail focused Craft-y Happy Hour, the tiki cocktail extravaganza known as the Art of the Tiki, the pet-friendly Yappie Hour, and the kid-friendly Fun and Fit as a Family. 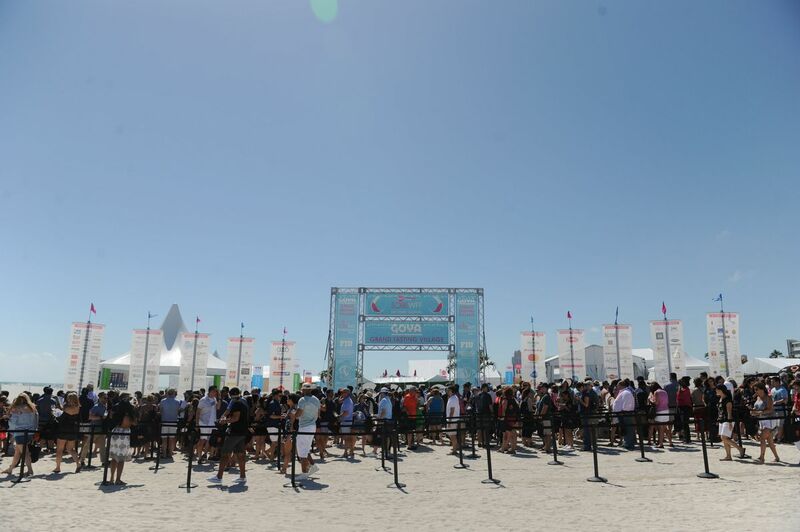 There is even an option to workout during the weekend at the annual Buddhas and Bellinis yoga event and a Bootcamp and Bites class hosted Robert Irvine. Every year, Miami's neighbors to the north, Fort Lauderdale, gets more and more into the action — and this year is no exception, making the festival very easily accessible to those in the 954. The fourth annual CRAVE series boasts 12 events this year, including a clambake with Alex Guarnaschelli, and Asian night market with Adam Richman, and a Bloody Mary Brunch hosted by Jeff Mauro and Geoffrey Zakarian.